This landed at our deck on the umbrella cord. It seemed fairly calm and occasionally crawled further up the string. We left before it did. Hello and thanks for the cool image. This cicada is of the species Tibicen canicularis. 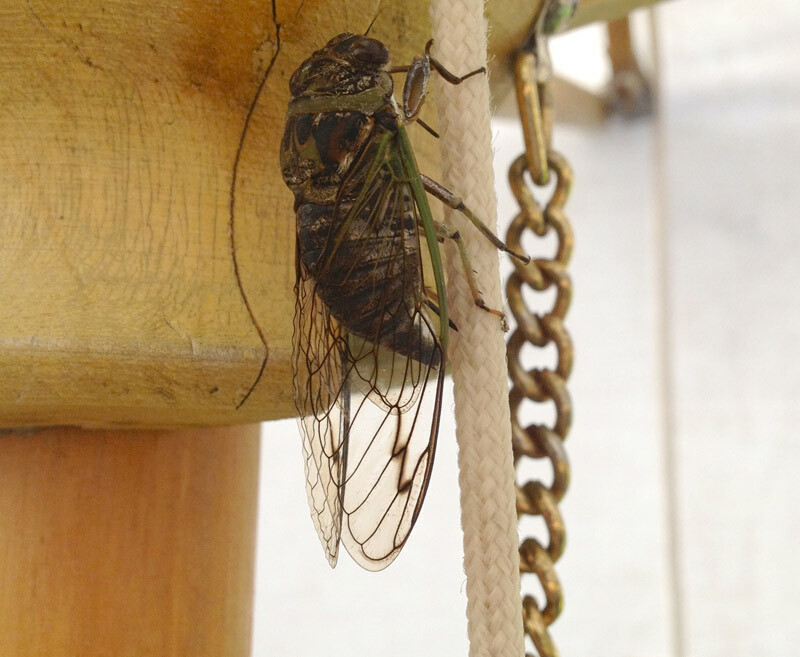 I don't know if you noticed but the reason it stayed calm and was there so long is because it is actually ovipositing (laying eggs) in the nylon rope! You can see the ovipositor facing downwards and penetrating in the cording of the rope. Tibicen cicadas have been documented laying eggs in substrates like pressure-treated wood, tree bark and even wooden furniture but I've not seen this before! Found this dead in Stoughton, MA on 8/7/2013. Could you please indentify it. Thank you. If you have a photo please submit it by submitting a report. Click the "Report a cicada or cicada killer wasp" link in the right-hand column. We'll identify it for you.